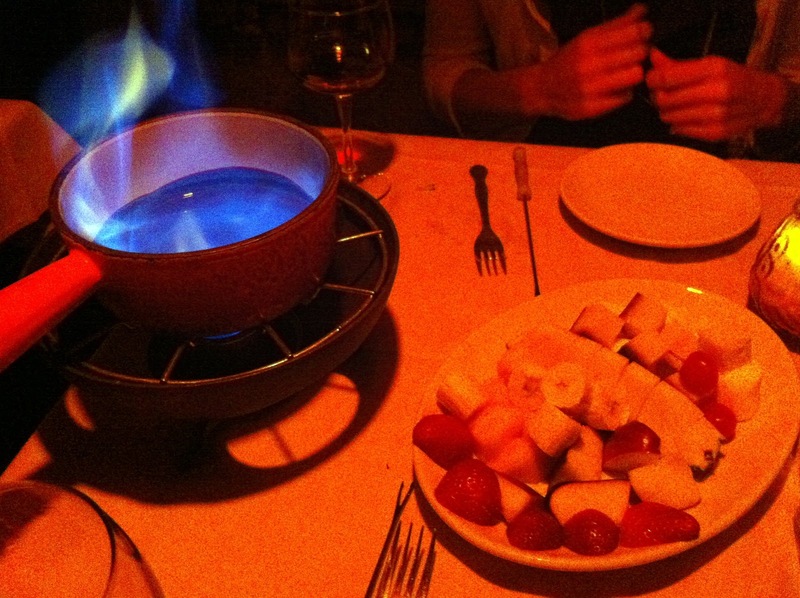 Last Friday Erica and I decided to have a nice, romantic fondue dinner at Geja's. 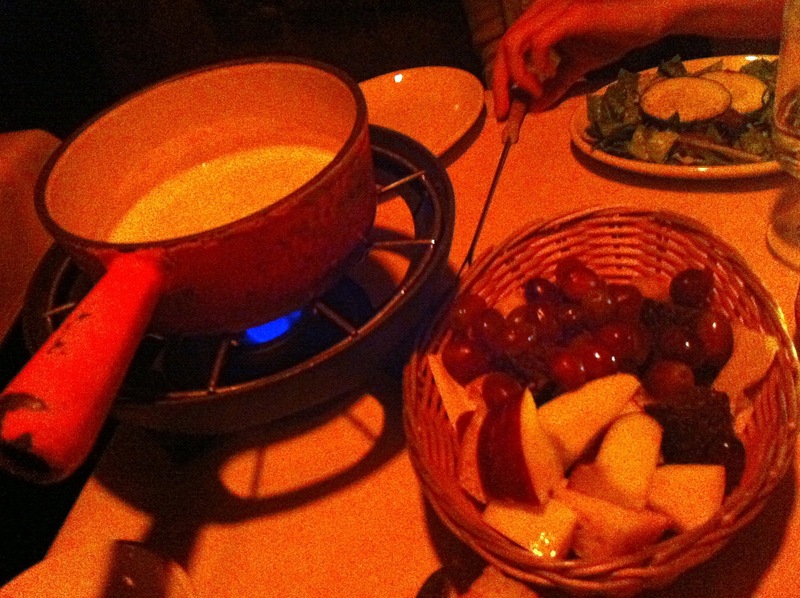 I'm surprised there are not more fondue places in Chicago. The melting pot is fine but has the obvious feeling of a chain restaurant and none of the charm of a neighborhood gem like Geja's. Writing a food review of fondue is tricky similar to a "build-your-own stir fry." Many of the flavors are self directed along with your success or failure. However, what separates Geja's, and makes it a fun and worthwhile meal, is the quality of experience. The setting and decor is great, the wine list superb, and the main course options extensive. Geja's does have an a la carte option, but most people choose the full premier dinner - salad, cheese fondue, main course and chocolate fondue. For our meal we both selected the beef tenderloin and scallops, even though each person can pick different "proteins." Everything was great and we left unable to finish our chocolate (a rarity, but Erica was too stuffed to help me). The cheese course was amazing and it took self-restraint not to kill our appetite on bread dipped in melted cheese. Our meat and scallops were also fantastic, especially when I did not overcook my steak. 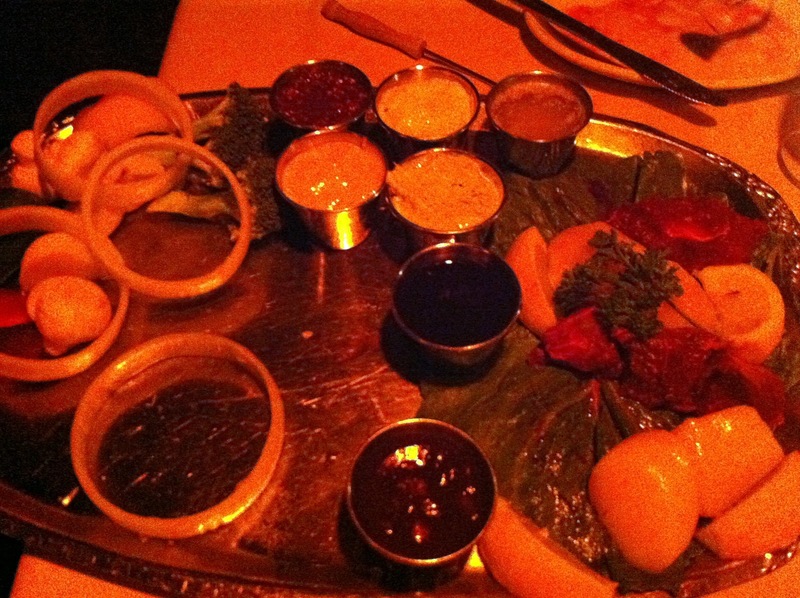 The main course is served with a variety of vegetables, including broccoli, peppers, potatoes, onions and mushrooms. The vegetables were especially important while cooking the scallops so the scallops did not fall off the skewer. Once cooked you have a choice of eight dipping sauces to flavor your treats. I enjoyed the BBQ sauce (sweet baby ray's) and teriaki sauce for my vegetables and tenderloin, respectively. The butter sauce and dill sauce worked well with the scallops. Everyone has their favorite, but they are all very good. 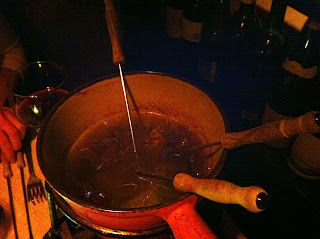 Lastly, the chocolate course is the most well known fondue experience. You get a basket of marshmallows, pound cake, bananas, strawberries, etc to dip into a warm pot of melted chocolate. There is no good explanation why dipping treats and fruit into warm chocolate is so much fun. Marshmallows and bananas were my favorite chocolate transporters. Geja's remains my go-to fondue spot in Chicago and highly recommended for first-timers or experienced masters of hot oil skewer cooking. It is a romantic dinner experience at a good value if you arrive hungry (most Premier Dinners are $40-$50 per person). Weekend nights usually feature live guitar music as well. Next time I might stick with the favorites and try the cheese-chocolate option.